Just How Dangerous Are Oil Rigs, Anyway? When a massive explosion occurred on the Deepwater Horizon oil rig off the coast of Louisiana on April 20, the first concern was for the 11 workers missing after the accident. A secondary fear was the environmental impact of the oil and natural gas that could be spilled in the accident  especially once the rig sank on April 22. The rig was producing up to 336,000 gal. of oil a day and carrying some 700,000 gal. of fuel oil at the time of the accident. A major spill would have threatened the sensitive Louisiana coast and resulted in the worst man-made environmental disaster since the Exxon Valdez ran aground in Alaska in 1989. The good news is that this spill looks as though it will be largely contained. The Coast Guard reported Friday morning, April 23, that a remote-controlled camera found that oil was not leaking from the deep-water well drilled by the rig. It's not clear why no oil appears to be leaking or whether the well will begin bleeding again in the future  crews were unable to close it before the rig sank  but for now, the environmental damage appears to have been blunted. "Right now it looks like we dodged a bullet," says Edward Overton, a professor emeritus of environmental sciences at Louisiana State University. But it is worth asking what might have happened. The Gulf of Mexico produces more than 1.6 billion bbl. of crude oil a day, almost a third of the U.S.'s total production, and drilling will not cease because of the Deepwater Horizon accident. Certainly the industrial Gulf is nothing like Alaska's pristine Prince William Sound, where the Valdez accident occurred, but that doesn't mean a major oil spill wouldn't have devastating environmental effects on the Louisiana coast. If ocean currents pushed the crude onto the coastline, it could damage the breeding groups for shrimp and oyster beds. It would also risk the safety of wild birds. Although unrefined crude isn't very toxic, it's heavy, and if it coats the wings of birds, it eventually smothers them. "The Gulf Coast is a sensitive breeding area that we're trying to bring back and restore," says LuAnn White, director of the Tulane Center for Applied Environmental Public Health at Tulane University. "Any time you have a spill in the Gulf, you have to be concerned." For such a serious accident, however, it looks as if the Gulf Coast will get off without major damage, provided the deep-water well doesn't open up again. BP, which owns the rig operated by the Swiss drilling company Transocean, has already dispatched more than 30 ships, capable of skimming in excess of 170,000 bbl. of oil a day, to counter any that does spill. In this case, the sheer ferocity of the accident might have lessened its environmental impact  much of the fuel oil and crude on the rig may have burned up in the initial fire. Still, the explosion is bound to generate criticism concerning the safety of offshore oil and gas drilling  coming just a few weeks after President Barack Obama announced support for increased offshore energy exploration. The reality is that while the industry has improved safety in recent decades, drilling for oil and gas in deep water is inherently risky. Seawater is corrosive to equipment, while wind and weather can turn lethal with little warning. A spill that can be relatively easily contained on land can quickly bleed out of control on the water. "Obviously the more you explore, the greater risks you have," says White. "What you need to have is a balance." 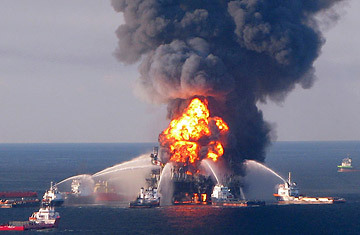 The question is whether the Deepwater Horizon accident might change the balance. Already a number of coastal Senators and governors have expressed concern about expanded offshore drilling, and analysts note that while a majority of Americans support more offshore exploration, that support may not be very deep. It was a major spill off the coast of Santa Barbara, Calif., in 1969, after all, that created momentum for a moratorium on new offshore drilling, and another spill could change the poll numbers today. Already New Jersey Senators Frank Lautenberg and Robert Menendez have said they won't vote for a climate-change bill if it allows expanded offshore drilling. "Big Oil has perpetuated a dangerous myth that coastline oil drilling is a completely safe endeavor, but accidents like this are a sober reminder of just how far that is from the truth," said Lautenberg and Menendez in a joint statement on April 22. For now, Coast Guard officials and BP will work to control whatever oil actually seeps into the water while continuing to search for the missing workers  although hope for their survival is growing dim. "A billion-dollar oil rig is scrap metal, and at least 12 people have lost their lives," says Overton. "This is still a significant accident."